Does your child have multiple food allergies or health concerns? Alert caretakers of his or her's special needs with just one bracelet! Adorn this bright, fun bracelet with various medical alert charms depending on your child's health concerns or food allergies. Charms can be added, rearranged or removed so change the bracelet as his or her needs change! To insert charm, position the charm/s horizontally and pull on the bracelet. Enter the charm rivet into the keyhole. Once inserted, turn the charm so that it is in it's vertical position. The key hole feature will keep the charm secure. Designed with adjustable snap feature with 3 slots allows this AllerMates allergy bracelet to fit the wrist. 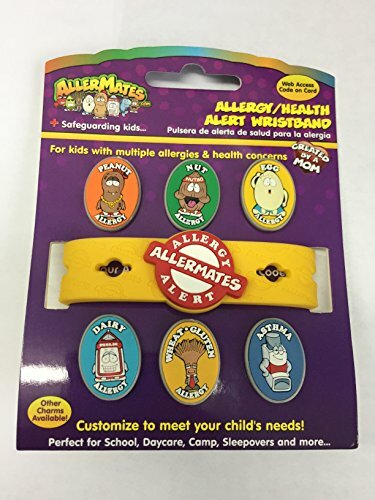 Medical alert charms included in this package are for the common food allergies of Peanut, Nut, Dairy, Egg, and Wheat/Gluten, as well included Asthma Charm.